Guys admit it, everyone has had a crush on their teacher at least once in their life time! I am sure you had a crush on one of your faculty too. If you say no, you are lying!! Now I studied in an all-girls school where all teachers were also female. But in our times we had these exciting tuition classes. I had joined a tuition class (which was like another mini school) because many of my friends were joining it! I was in 7th or 8th standard at that time. We had a lot of fun specially because we met a lot of new girls and ‘boys’ and made friends with some. That was also a place where we constantly judged a lot of girls and boys. Who has feelings for whom? Why this girl is getting so close to that boy, ohh that poor boy got dumped by that girl so on and so forth. Seriously when I think about it now, I can only say what nonsense creatures were we. This was also the place where one day a hot dude entered the class – the maths class and everyone went :O awwww… the guy was a third year college student that time who had just joined there as the maths teacher! Vikram Sir, that’s what we called him! I too was quite carried away by his charms! I used to (I still) hate maths but never missed a class just because this guy was cute! Okay okay, I was a gullible teenager then, it happens. But I was careful enough to circle that part of the page where he had placed his finger and then pasted a cellophane paper patch on it!!!! Seriously I was that naïve! I am laughing as I am writing this down! I was travelling in a local bus once, I guess after a dance class, when I saw this Vikram Sir, sitting there. I simply looked at him and thought, does he recognize me? He smiled at me! And I don’t know why he smiled! I still can’t digest how dim-witted I am sounding with this crush on teacher story! But it happens I guess, in everyone’s life! P.S. I seriously hope no one I know from that tuition class or this entity Vikram is reading this! Let me know if you are enjoying the anecdotes! 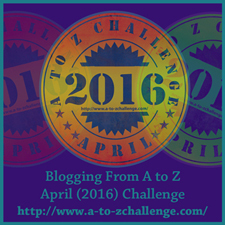 This post is written for the A to Z Challenge 2016 for Day 6 Letter F. Visit A to Z, BlogChatter to read other beautiful bloggers!